In a large bowl, add the flour, butter and shortening. Mix together until the mixture resembles pea-sized pieces. Add the water slowly and mix until you have a firm dough. Form into a disc and wrap in plastic. Roll out the pastry on a floured surface, then line a pie plate with the pastry. Prick the base with a fork and press a sheet of aluminum foil around the pastry edge. Chill for 10 minutes. Bake for 10 minutes, remove the foil and bake an additional 5 minutes. Add olive oil to a large frying pan and heat on medium-high heat. Add bacon and fry until crisp. Using slotted spoon, transfer bacon to paper towels and drain. Add the cheese, half & half, mushrooms and bacon to the eggs. Stir until well blended. Season with salt and pepper to taste. 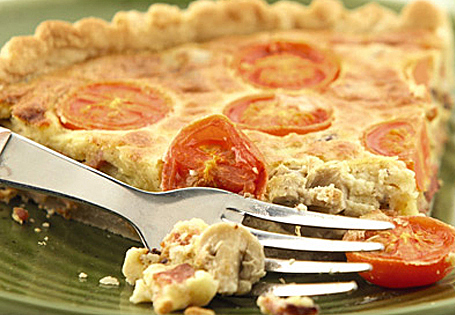 Pour egg mixture into the baked pastry shell, top with the cherry tomatoes and bake in the oven for 45 minutes or until crust is golden and filling is set. If necessary, cover with foil prior to baking to prevent over-browning.